Compact structure, low initial investment. 5. 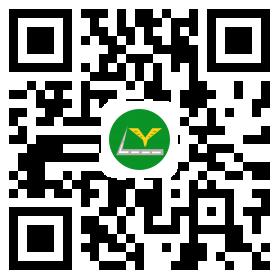 Low initial investment and highly cost effective. Aggregate batching system main includes: batch hopper, feeding belt, collecting belt, vibrating screen and belt conveyor. There are 4 batch hoppers carrying aggregates with different specifications to meet the gradation requirements of asphalt mixture. At the lower part of each batch hopper equipped with adjustable belt feeder, which can realize stepless speed regulation. The collecting belt under the hoppers will collect the aggregates and transfer them to the vibrating screen. 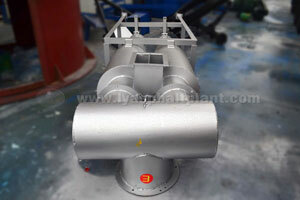 Particles with diameter >40mm will be screened out, and the rest will be sent to the belt conveyor. 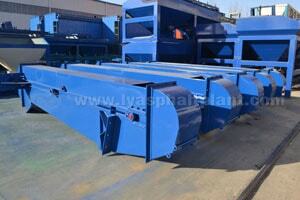 Then the belt conveyor will move the aggregates to the drum dryer (drying drum). Drying & mixing system consists of drying cylinders, combustion devices, and oil ignition system components, etc. 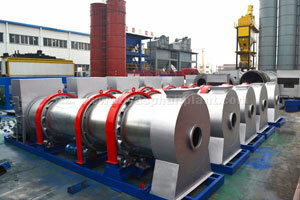 Drying drum contains 4 carrier rollers, 2 rolling rings, 2 blocking wheels, a cylinder and shovel plates. The cylinder was supported by carrier rollers with its rolling rings and driven by the reduction gears stably and evenly. When aggregates get into the drying drum, they will be raised by the shovel plate to the highest point and then poured down, forming a wall where the fire will go through to dehydrate the materials. The cylinder is rolling with inclination of 3.5°to get the aggregates mixed with bitumen and out off the cylinder for elevating in right time. 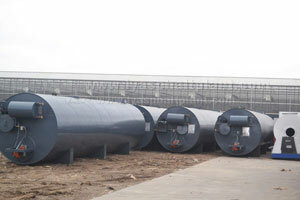 The bitumen supply system is composed of bitumen tank, bitumen gear pump, pipes and bitumen spray tube. 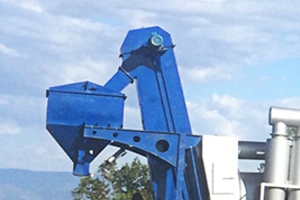 The gear pump is driven by the adjustable-speed motor and transfer the bitumen from bitumen tank to the drying drum for mixing process. 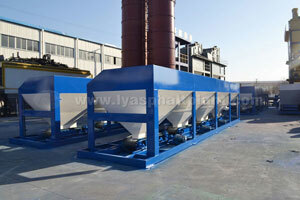 The dust collecting system has two collecting levels, cyclone dust filter and water dust collector. The purified air flies up and gets discharged from the chimney, while the dust mud sinks in the sedimentation basin thanks to the gravity. Finished product elevator has driving device, chains, chain wheels and a hopper. Its main function is to raise the finished product up to the storage silo. Finished product silo is used to temporarily store the asphalt mixture before truck loading. It mainly includes stand columns, storehouse, ladders, etc. 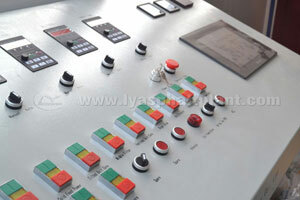 The Electrical control system which adopts centralized control technology, is composed by distribution cabinets, control room and other small auxiliaries. All the electrical components attached to the distribution cabinets are brand products, qualified and durable.